These Oatmeal Rolled Sugar Cookies are an old-fashioned cut-out sugar cookie recipe with a chewy twist thanks to the addition of rolled oats and almond extract. We love them frosted with buttercream frosting and topped with colorful sprinkles! In the bowl of a stand mixer, beat the butter and sugar on medium-high speed until light and creamy, about 2-3 minutes. Add the eggs, vanilla, and almond extract and mix again, scraping down the sides and bottom of the bowl. Add the flour, salt, and baking powder, mixing just until combined. Stir in the rolled oats. Transfer the cookie dough to a piece of plastic wrap and shape into a disc with your hands, then wrap tightly and chill for at least 2 hours. When ready to bake, preheat the oven to 350 degrees F. Line a baking sheet with parchment paper or a silpat mat. Roll out the chilled dough to 1/4-inch thick and cut out with cookie cutters. Transfer to the baking sheet and bake for 10-12 minutes, just until edges are barely starting to turn brown. Cool completely on a wire rack, then frost with buttercream frosting and decorate with sprinkles. Beat the butter using a hand mixer or the whisk attachment on a stand mixer. Add the powdered sugar, 4 tablespoons of heavy cream, vanilla, and salt and beat on low speed until combined, then increase the speed and beat until light, adding additional cream to get to a frosting consistency. Use food coloring to achieve desired colors, if you choose. 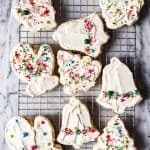 You can sandwich two of these cookies together with the frosting for a delicious sandwich cookie, or just decorate with frosting and sprinkles like in these pictures.